← Hate Crime Victim or Something Else? Just finished this. It’s an acrylic painting on a wrapped canvas, apx. 20 X 18. 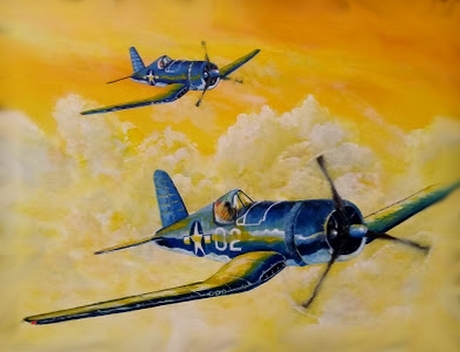 Titled “The Wingman.” It depicts two WW2 Corsairs flying high above the evening clouds in the Pacific. Actually the painting is not quite done, I have some detailing to finish, but I thought you would enjoy it as is. I am going to add a number on the distant plane and fix the white stripe on the cowling so it shows a better contour. I also want to adjust the emblem on the lead plane, the white stripe dips a little too much to the tail of the plane. Do you see anything else I should fix? As always any comments, good or bad, are always welcome. Shown above is the actual plane. This entry was posted in Art and tagged corsair, Jack Lee Art, Painting, Wingman. Bookmark the permalink. Well done, Jack. You have a real talent! J. Soden…. thanks for the compliment. I put a clear coat on it today and added an old wood frame I bought a few months back, kinda helped set it off. What does the arrow on the vertical stabilizer mean? And what does the arrow on the wing mean? You ever see that TV show Black Sheep Squadron from the mid ’70s? (I think it was on from late ’75 or ’76 through ’78.) 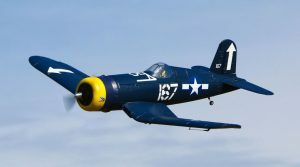 On that show they had real Corsairs and I remember one had a white arrow on the wing just like what you have but I never saw an arrow on the stabilizers. If you want, you can probably find some of the episodes on youtube and I believe you can buy DVDs of the episodes. Sorry, I’m not so smart when it comes to airplanes. WHITE ARROW – Wolf Gang. This was a squadron design and it meant they were F4U’s flown from the USS Bunker Hill. The squadron was known as the Wolf Gang. Here is something you might find interesting. Thanks for that link Ted.